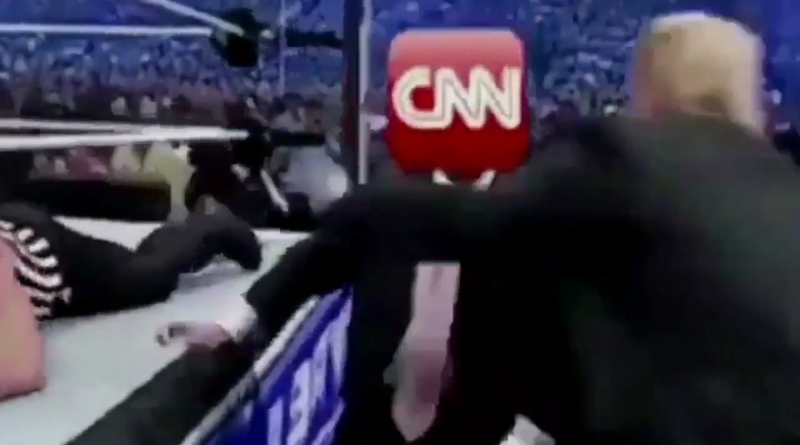 On July 2, President Donald Trump tweeted out a video showing himself, as he had appeared in a 2007 WrestleMania event, attacking a person whose head had been replaced with the CNN logo. Two days later, CNN reporter Andrew Kaczynski wrote an article about the origins of the video and the anonymous Reddit user who had made it. The article quickly turned into a scandal for CNN, as Trump supporters and media ethicists both accused the network of blackmailing or bullying the video creator, a Reddit user calling himself HanAssholeSolo, by threatening to expose his real identity. The Intercept’s Glenn Greenwald, in his version of the indictment, argued that “one of the nation’s most powerful media corporations is explicitly threatening a critic with exposure” and that CNN had chosen to “threaten and punish a random, obscure citizen.” Right-wing Twitter accounts published the address and other personal information of Kaczynski and his family as an act of retaliation. The backlash caught CNN by surprise—in part, according to people familiar with the editing process, because the passage in the story that provoked the backlash had been written by a network executive as a defensive measure to explain their sourcing decision. The sources say the ongoing media morality play has been based on false assumptions about the purpose of the story, and about how a thorny reporting process had unfolded. The result is a case study in how not to avoid outrage. CNN published Kaczynski’s article on July 4. Earlier that day, HanAssholeSolo, who had originally celebrated Trump’s attention, posted a public apology for having created the GIF that went into Trump’s tweeted video, and for having posted a variety of racist memes, including a chart listing prominent Jews who work for CNN. The apology came after Kaczynski had managed to identify the user and send him an email, but before the user had responded to Kaczynski and confirmed his real name. In the piece, Kaczynski chose not to publish the user’s real name. This theory was corroborated by five people with knowledge of the editorial process that led to publication. According to those people, the passage was drafted and proposed by Richard “Rick” Davis, a 37-year veteran of CNN who is the network’s Executive Vice President of News Standards and Practices. It was added at or very near to the final stage of editing—long after Kaczynski had concluded his reporting. Davis’s proposed wording was not inserted by edict, nor did it fall outside CNN’s normal editorial process, said the people familiar with Davis’s involvement. Kaczynski’s article was seen by a large number of editors at the network, and it went through all of the established procedures prior to publication. The story of HanAssholeSolo’s apology was moving quickly on Tuesday, however, which meant that the process was not as a deliberative as it might have otherwise been. Throughout the editing and review, nobody flagged Davis’s proposed language as troublesome. There were three main reasons for this oversight, the sources said: CNN wanted to publish a timely piece, given that the apology had already been posted; Davis wasn’t asking for any parts of the story to be caveated or removed (a common occurrence in pre-publication vetting); and, perhaps most importantly, Kaczynski’s team, known as KFILE, didn’t regard the question of naming or not naming HanAssholeSolo as the central point of the story in the first place. Kaczynski and his KFILE colleagues, the sources said, had begun the investigation in hopes of determining the exact journey that HanAssholeSolo’s GIF had taken from Reddit to President Trump’s Twitter. They were especially curious about what role the White House’s social media director, Dan Scavino, may have had in finding and distributing the clip—wanting to know if HanAssholeSolo had been in contact with Scavino, and if so, who had initiated it. Ultimately, CNN found no cooperation between HanAssholeSolo and Scavino. The fact that the Trump administration had plucked this particular user out of obscurity, without his permission, made the decision not to name him a simple one, these people said. But readers took the passage about the decision to mean that CNN had only granted HanAssholeSolo anonymity because of the apology. Even while CNN was startled by the reaction, some employees privately agreed that Davis’s language, about “CNN reserv[ing] the right” to name HanAssholeSolo, read as threatening. At the same time, according to the sources, CNN’s executive leadership resisted calls to remove the passage or clarify its meaning. Their reasoning: Any edits or changes to the article itself would suggest CNN had done something wrong, which would only embolden its army of enemies, many of whom believe the network is hopelessly biased against Trump. Instead, the network issued a statement on July 5 that said, in part, “Any assertion that the network blackmailed [HanAssholeSolo] or coerced him is false.” That echoed Kaczynski’s tweets from the night of July 4, in which he said that HanAssholeSolo had assured him, in a phone call placed after Kaczynski’s article was published, that he “was not threatened in any way.” But CNN still didn’t back down from the original language. This reaction frustrated most of the sources familiar with the editorial process. They pointed out that many of CNN’s leaders aren’t regular users of social media, where much of the backlash fomented and where Kaczynski has received near-constant harassment. Davis, for example, does not appear to have a Twitter account. Kaczynski and his colleagues now find themselves in the position of trying to defend their work without defending the apparently threatening passage. And the fact that CNN has adopted a bunker mentality against pro-Trump critics suggests that the passage is here to stay. At this point, altering or removing the passage would amount to second-guessing CNN’s leadership. After all, the text employs an institutional voice—“CNN reserves the right”—in which only a handful of executives, including Davis, are allowed to write. Another such executive is Jeff Zucker, the president of CNN. The people familiar with the editorial process gave varying accounts of how closely Zucker was involved in Kaczynski’s article prior to publication, but otherwise confirmed that he was aware that the article was in the pipeline, and familiar with its contents. Zucker did not respond to a request for comment, and did not directly address the controversy in a Wednesday interview with the New York Times. CNN’s handling of the story has led to predictable consequences for Kaczynski, who continues to face threats and harassment directed at him and his family. Kaczynski referred our questions to a CNN spokesperson, who declined to discuss the network’s editorial practices. Davis did not respond to requests for comment.